Stomper, the birth of a new ale for the jazz season! 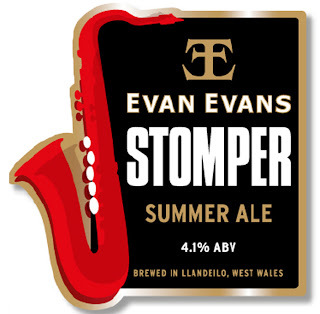 The brewing team at Evan-Evans Brewery in Llandeilo have been working overtime to create a new beer for the Welsh jazz season. With the Llandeilo Jazz Festival (July 6-8) on the immediate horizon and Brecon Jazz at the beginning of August, the brewery decided to produce a new light summer ale for these major jazz festivals. The new beer is light straw in colour and is brewed using the finest winter barley malts. With a light summery bitterness, this new beer is sure to be in great demand. Brewed by James Buckley, 23, the seventh generation of the Buckley brewing family, the beer has been designed to be an easy-drinking ale. “This beer is a super new summer beer which we trialled some weeks ago. It received rave reviews. It is easy drinking, malty and a fun new beer which I am sure the jazz drinkers of Wales will love. 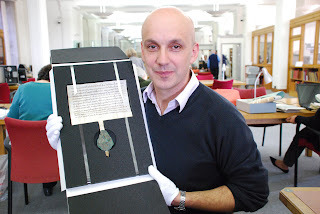 A five-month exhibition showcasing the research of Aberystwyth and Bangor universities into medieval seals in Wales from 1200-1550 is running at the National Library of Wales. The exhibition, Seals in context: Medieval Wales and Welsh Marches, is housed at the National Library’s Hengwrt Gallery and runs until the end of September 2012. The ‘Seals in Medieval Wales’ (SiMeW) project, undertaken by the Department of History and Welsh History at Aberystwyth in collaboration with the Department of History and Welsh History at Bangor University, is funded by the Arts and Humanities Research Council. The project has been running since September 2009 and has recorded around 3,500 seals from across Wales and the Marches in order to explore aspects of medieval society and economy, politics, religion and expressions of identity in new ways. Seats are going fast for South Wales entrepreneur Kevin Green's latest two-day 'Wealth Intensive Training' course taking place in London, July 21-22. It's my pleasure to invite you to attend a Two-Day Wealth Intensive Training course. I'll share my successful in-depth high-profit structures and give delegates a complete toolkit to wealth creation. Approximately 50% of the training sessions focus on property/property related businesses and 50% on other high cash flow and profitable business start-up strategies. The price is £20 per seat, with proceeds to Make-A-Wish Foundation UK, of which I am an ambassador. In less than seven weeks, the Llandeilo Jazz Festival (July 6-8) has grown from an idea into a music festival, with an exciting brand marketing platform. Part of the success of the marketing has been the new and unique branding created by Nick Pettit, of Nick Pettit Design, based in London. Nick is the retained designer for the Evan-Evans Brewery and is one of the UK’s top beer-brand designers. “There is little doubt that Nick’s highly creative design has set the festival on the right road to success,” said Simon Buckley, chief executive of the Evan-Evans Brewery, the festival’s main sponsor and organiser. 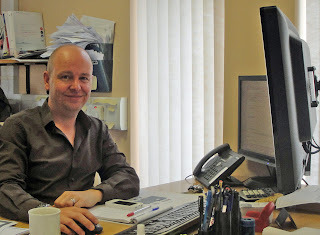 Nick Pettit said: “I am delighted to have been part of the evolution of this great new event. The leader of Carmarthenshire County Council has said his authority is ready to help workers at the threatened Dewhirst warehouse in Ammanford. Dewhirst, which manufactures clothes for the Marks and Spencer chain, will soon start consultation with unions and staff over potential redundancies at the site, which has 124 staff. The company uses its site in Capel Hendre to store and check products made abroad before being sent to shop floors. Council leader Cllr Kevin Madge said: “We have made approaches to both the Welsh Government and Job Centre Plus and all three of us are in dialogue in readiness for any developments on this issue. “We have obviously offered as much support as would be needed to assist the firm and its employees in any way we can. Savannah Kitching gold and silver, Abbie Hanford silver, Teegan Jenkins silver and bronze, Ffion Davies, Demi Wright bronze, Sabrina Evans silver, Ciara Mcfarlane. 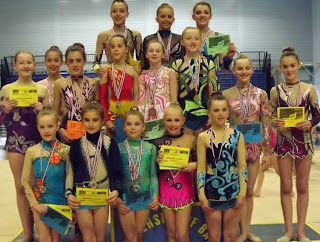 Carys Davies bronze, Lauren Carmon gold and bronze, Martha Morgan silver and bronze, Anastaisia Baidenko gold and bronze, Gemma Frizelle, Casey Williams silver and gold, Nikara Jenkins junior overall champion gold and silver, Rhiannon Elphick silver and bronze, Olivia Davies silver and bronze. Llanelli coaches Nia Thomas and Jess Bolton were part of the judging panel. Thanks go to Lisa Evans (Sabrina's mother). The Holiday Heaven and Hell column from the South Wales Evening Post, featuring Padraig Lalor. 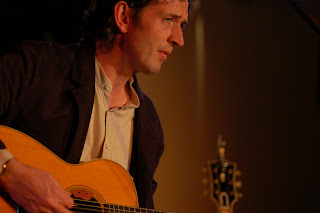 Padraig Lalor is a singer-songwriter with Ammanford-based Irish band Henry Marten’s Ghost. He recently released his first solo album. Ismay’s Dream is all about the links between Belfast (Lalor’s home city) and the Titanic. My wife and I went to Guernsey in the Channel Islands a few years ago. Guernsey is very old fashioned with different laws from the UK. We stayed in a great hotel where the service and food was excellent. The local islanders are very friendly and wherever we went we had great hospitality. The island’s links with France are everywhere, as are signs of the German occupation during World War Two. The island of Sark was the highlight of our stay. It has no traffic and is full of old world charm. The short boat journey from Guernsey to Sark takes in some wonderful views of the other Islands such as Herm and Jersey. The traders in Llandeilo are warming up for a busy jazz festival weekend (July 6-8). The festival is hosting a series of street music events around the town, making sure shops and cafes feel the beat of the music. The organisers have insisted that the festival is for the benefit of the town’s traders. No outside food purveyors are being allowed to take part. “This is a great new event for the town, where we are all going to benefit from the crowd that will come for the music. We, along with the other food providers and cafés in the town, are going to provide a great food offering for the event. “I hope that this will develop into an annual event and in time become as prestigious as Brecon. “I am sure that all the traders are looking forward to what will be a busy and, hopefully, a memorable event. Latest incidents reported by the fire service . . .
Nant Fach, Llangranog, New Quay: Appliances from Newcastle Emlyn and New Quay attended a road traffic collision involving a pick up truck and a JCB fast track vehicle at Nant Fach, Llangranog. Fire Service released one male casualty using cutting equipment. The casualty was taken to hospital by ambulance. Cwrt y Gollen Barracks, Crickhowell: An appliance from Crickhowell attended a gas leak at the Cwrt y Gollen Barracks in the town, caused by workmen collecting hay. The leak was isolated and properties nearby were advised to remain indoors, keeping windows and doors closed. The A40 was closed as a precaution. South Wales Fire and Rescue Service provided an appliance from Brynmawr as support. Mid and West Wales Fire and Rescue Service are holding and attending a range of different practical and educational events during Child Safety Week (until 24 June 2012) to help parents, carers and young people learn more about keeping children safe from fire and reducing the risk of serious accidents. Throughout the week Young Firefighters in Swansea, Lampeter, Neath Port Talbot and Carmarthenshire will be talking to their peers at local schools and youth groups about home fire safety. As part of the service´s ongoing Phoenix Project, courses are running throughout the week in Machynlleth and Haverfordwest for young people aged 11 to 25 years old to help build confidence and promote independent thinking through fire service activities. 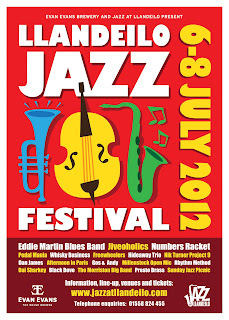 The countdown is well and truly on to the first Llandeilo Jazz Festival on the weekend of July 6-8. The event is being presented by Jazz At Llandeilo and the town’s Evan-Evans Brewery. Among the acts at the festival will be – the Eddie Martin Blues Band, Hideaway Trio and Whisky Business. Concert venues include The White Horse, The Angel, The Cawdor – with a special jazz picnic around the Penlan Park bandstand on Sunday afternoon. This is the first of what I hope will become an annual jazz festival in Llandeilo. We have tried to put together a line-up that suits all tastes, from ‘Trad Jazz’ to Gypsy and Blues. Each venue has a different line-up and music throughout the day. This is a pub-based festival, with street music and a Sunday picnic planned for Penlan Park, and bandstand. Entry to the Festival is free, but you must have a ticket. Cor Meibion Llanelli 'poster boys' on a sales drive! Cor Meibion Llanelli choristers were busy yesterday morning selling tickets outside the Jenkins Bakery shop for the forthcoming annual concert. It is at the Selwyn Samuel Centre, Llanelli, on Saturday, June 30. Tickets are available from Jenkins Bakery in Trostre, Manhattan Marketing in Thomas Street and any chorister. Preparations are continuing for this year’s Junior Football Festival and Fete which takes place on Saturday 7th July at Richmond Park, home of Carmarthen Town AFC. Executive committee member Paul Ashley Jones has issued the following appeal - This is an important part of the Club’s Community Programme and as always your help is needed. Without the help of our supporters the event cannot take place. Programme sales – we have a small number of supporters currently going door to door selling Programmes at £1 each. If you are able to spare a couple of hours to help out over the next two weeks then please call Paul Ashley-Jones on 07775 820864. Many hands make light work and your help would be very much appreciated.If you don’t want to sell door to door but could take a number of programmes (however small) to sell to family, friends or work colleagues then please let Paul know. Meet Brechfa - the village fighting back against school, pub and chapel closures. How can a Welsh village survive the closure of its chapel, school and pub? Brechfa in Carmarthenshire is fighting back, as Sion Morgan reports. The traditions of our Welsh villages have long been under attack, driven by an influx of city-based home buyers, the closure of pubs, post offices and schools – and all the while crumbling churches and chapels suffer dwindling congregations. Brechfa, population 300, a settlement that has existed in the Cothi Valley in Carmarthenshire since the 6th century, is one such example, described by residents there as “a shadow of its former self”. Now those living in the west Wales hamlet are working together to rediscover a sense of community left behind by an ever-evolving society. A cyclist has suffered serious injuries in a road crash with a lorry in Carmarthenshire. Police have appealed for witnesses to the collision on the A40 between Carmarthen and St Clears in Carmarthenshire on Wednesday. A spokesperson said the man suffered serious injuries and was airlifted to hospital. Aberystwyth University’s Computer Science student, Peter Faraday Weller, who is a distant relative of the famous British chemist and physicist Michael Faraday, is among the five finalists to have made this year’s Graduate of the Year competition shortlist. 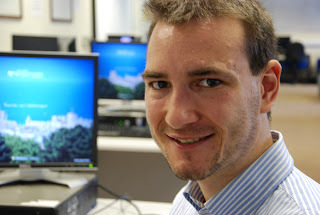 Although profoundly deaf, the 22-year-old third-year student is a very talented software developer who won the Google Europe Scholarship for Students with Disabilities and also secured a summer placement at IBM in 2011. Graduate of the Year takes the form of a public vote and is open to graduates across the whole of the UK in all disciplines. The deadline for votes is Saturday 30 June. Carolyn Parry, Acting Deputy Director of the University’s Careers Service, explains, “We would like to congratulate Peter on his achievement to date and we also wish him well for the future. More than 150 great welsh voices will unite together with music from the exciting worlds of Opera, World Cinema, Broadway, Oratorio and rousing Welsh favourites to raise funds for homeless Kenyan children at a Swansea concert. The Brangwyn Hall Gala Concert will bring together the 150 massed voices of the Llanelli Choral Society (pictured top), Morriston RFC Male Choir (above) and acclaimed soprano Fflur Wyn (above) for a magical music journey under the direction of conductor John Hywel Williams, broadcaster Mal Pope and organist Huw Tregelles Williams. The night will feature highlights of world of Film, Broadway, Opera, Oratorio and Welsh favourites including Phantom of the Opera, Vangelis’ acclaimed film score 1492 Conquest of Paradise, Aida's Grand March, Hallelujah Chorus, Anthem from Chess and a roof raising massed voice Welsh favourite of Tydi a Rhoddaist. Pembrey & Burry Port communities have a new Community Regeneration Officer. Jo Leeuwerke is the officer who will be liaising with the communities with the aim of providing an important front line link between community members and groups, Local Authority departments and service delivery agents. • Liaising with and supporting physical regeneration projects, ensuring effective communication and community consultation. Jo’s office is located on the first floor of Burry Port Library (access via the rear of the building). Main office hours are Mon-Thurs (8:45am – 5:00pm) and Fri (8:45am – 4:30pm) E-mail: jleeuwerke@carmarthenshire.gov.uk. Tel: 01554 742185. Essential maintenance works are underway on roads across Carmarthenshire. The equivalent length of about 54 miles of a standard single carriageway will be treated – the distance from Carmarthen to Bridgend! The resurfacing works are carried out annually by the county council to help prevent potholes and make the roads safer and better to use. Some 8,000 tonnes of aggregate and 233,000 gallons of bitumen emulsion will be used covering an area of 663,000 square metres. Executive Board Member for Street Scene Cllr Colin Evans said although it caused some inconvenience for drivers, it was an essential maintenance operation. “This work prevents water seeping into the road foundation and weakening it, thus reducing the chances of potholes developing, and prolongs the life expectancy of the road,” he said. More than 6,000km of grass verges throughout Carmarthenshire are getting their annual cut. Carmarthenshire County Council has a statutory duty to maintain the highway in a safe condition for motorists and pedestrians. The council generally carries out one cut a year; however, a second cut may be carried out in some areas in early September, depending on weather and growing conditions throughout the season. Executive Board Member for Street Scene Cllr Colin Evans said: “The maintenance of road verges is an important service provided by the council. In the interests of safety, vegetation on verges is kept trimmed to avoid obscuring of signs and visibility splays. A man has been fined £75 for fly-posting on lampposts in Carmarthenshire. The council’s environmental enforcement officers issued the fixed penalty notice to the man for putting up the posters along the A48, A40 and A476 main roads. Failure to pay could lead to prosecution in the magistrates court. It is hoped the fine will help to raise awareness that fly-posting is a criminal offence. 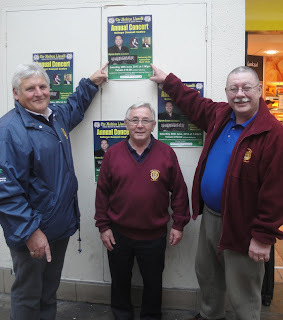 The council has a fly-posting policy in place to help keep the county clean and to stop unfair advertising. Fly-posting also has the potential to distract motorists and cause accidents. “They make an area look untidy and if not removed the posters slowly rot, becoming even more unsightly and causing litter. Have some fun over the summer months and win some prizes by jumping to it to help seek out Carmarthenshire’s Olympic Gold hopeful Dai Greene. That’s the call from Carmarthenshire County Council which is inviting Llanelli shoppers to spot Dai Greene during the six-week countdown to the London 2012 Olympics. Dai may be travelling to different competition venues across the world or locked down with his strict training regime, but there is still a chance to see him because a lifesize 6ft 1ins cardboard cut-out of Dai will be hidden among the town’s shops every Friday starting this week. He could be peering out from one of the shop windows or standing as if to serve you behind a fruit stall, so keep your eyes peeled. Dai will be hiding in a different shop every Friday over the six weeks of competition, starting June 22. If you spot him, simply take a picture and upload it on to the council’s Facebook page, or Tweet us at@CarmsCCPress. A three-day international conference aimed at enhancing collaborative working among professionals in child education, training, social work, voluntary work, government and academia will be held at Aberystwyth University on 27th - 29th June. Organised by the University’s School of Education and Lifelong Learning, the conference will include contributions by experts from around the world with more than 70 papers presented over the three days. Countries represented will include England, Australia, Canada, South Africa, Belarus, The Netherlands, Finland, China, Sweden, Ireland, Azerbaijan, Portugal, New Zeland, Greece, Scotland and Wales. The conference ‘A Child's World - Working Together for a Better Future’ has been devised to set new concepts in collaborative practice in childhood studies against social, legislative and organisational changes within an international strategic dimension. 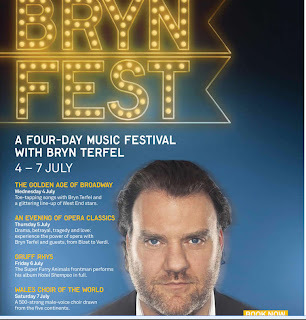 Much-loved bass-baritone Bryn Terfel is celebrated in this four-day festival of Welsh and international musical talent. At the heart of BrynFest are four Royal Festival Hall performances that see Bryn with West End stars performing songs from musical theatre’s golden age, and with opera stars treating audiences to an evening of classic opera arias. Both events are accompanied by the Orchestra and Chorus of Welsh National Opera. Equally roof-raising is a night with Super Furry Animals’ frontman Gruff Rhys, and Wales Choir of the World with Bryn and a 500-strong international male choir premiering Karl Jenkins’ new work. The festival climaxes with Bryn’s Big Sing where you can join Bryn and hundreds of others to belt out rousing Welsh songs on the Royal Festival Hall terraces. Plus you can prepare your vocals for Bryn’s Big Sing with after-work Choral Clubs, catch music from Huw Warren and Neil Yates, and see a showcase of the finest young Welsh vocal talent. Carmarthenshire’s director of regeneration and leisure Dave Gilbert has been awarded an OBE in the Queen’s Birthday Honours. The citation says that Mr Gilbert has received the award for ‘services to Regeneration and Skills and to the community in West Wales’. Mr Gilbert, who joined Carmarthenshire County Council as director of regeneration and leisure nine years ago, said he felt very honoured to receive the OBE which had come as a surprise. He said: “This recognises the efforts of our highly professional regeneration team. I lead the team but it’s the team that’s being recognised. “We have had lots of physical regeneration projects such as the town centre scheme in Carmarthen and the one underway in Llanelli, and leisure developments at Parc y Scarlets, Ffos Las Racecourse and Carmarthen Leisure Centre. A woman has been fined £75 after throwing a cigarette end from her car at Parc Trostre in Llanelli. The car was parked on the entrance road to McDonald’s and the woman was seen by council environmental enforcement officers who were on patrol in the area. Failure to pay the fixed penalty notice could result in prosecution in the magistrates court and a maximum fine of £2,500. Executive Board Member for Environmental and Public Protection Cllr Jim Jones is reminding people that throwing litter – including cigarette ends – is against the law. Research shows that 83% of litter found on the county’s streets is smoking-related. A Llanelli teenager has been fined for not cleaning up after her dog. The council’s environmental enforcement officers were driving through Felinfoel when they saw the dog fouling in the grass verge. The woman with the dog failed to pick up the mess and walked off. The officers stopped the car and identified themselves explaining what they had seen and that it was a criminal offence. The 19-year-old was issued with a fixed penalty notice for £75. Failure to pay could result in prosecution in the magistrates’ court and a fine of up to £1,000. Executive Board Member for Environmental and Public Protection Cllr Jim Jones said he hoped this fine would act as a warning to others that anyone caught failing to clean up after their dog will be fined. “There is nothing worse than stepping into dog mess not to mention the fact that it is a serious health risk. The majority of dog owners are responsible but unfortunately there are still a few who do not listen. A ‘Dog Watch’ scheme has been launched in Carmarthenshire to tackle dog fouling. Residents are being encouraged to help the council catch offenders by reporting any incidents they see. Environmental enforcement officers can then follow up reported offences and target areas of greatest complaint. Anyone caught failing to pick up after their dog can be issued with a fixed penalty notice of £75 or face prosecution in court and a maximum fine of £1,000. The scheme was launched during National Poop Scoop Week and residents can easily report offences either by telephoning Carmarthenshire Direct or reporting via the website. Executive Board Member for Environmental and Public Protection Cllr Jim Jones said: “Local people often know who the offenders are, and can help tackle the problem of dog fouling in their area, by reporting them to the council. The Leader of Carmarthenshire County Council has congratulated Shane Williams on being awarded the MBE. The former Ospreys, Wales and Lions star received the award in the Queen’s Birthday Honours. Carmarthen chartered accountant and business consultants are sponsoring a key seminar for the West Wales Law Society tomorrow (Thursday). The seminar has the topic - 'New Anti-Money Laundering Compliance 2012 - How to profit and protect in your firm'. The seminar is taking place at The Halliwell Centre, the University of Wales Trinity St David in Carmarthen. David Butler and Nigel Roberts, from Clay Shaw Butler, will make the opening remarks. The guest speaker will be Tania Tribius of Tower Training. Tania Tribius LLB AKC FRSA has 20 years experience as a Solicitor and London Partner. Her specialist expertise is Anti-Money Laundering, Risk Management, general Compliance for Solicitors and Legal Practice Management. Managing director of legal specialists, Tower Legal, Tania provides in-house consultancy, face-to-face training and precedent materials to MLROs, COLPs, COFAs, Managing Partners and all staff. The countdown is well and truly on to the annual Carmarthen Town AFC Fete, which will be held at Richmond Park on Saturday, July 7. The fete includes a football festival for primary school children from schools and clubs. Anyone wishes to enter a team should contact Emlyn Schiavone on 07917367793. The fete will be officially opened at 10.30am by Carmarthen Town Mayor Councillor Phil Grice. Funds raised through the fete and football festival will go towards the Carmarthen Town AFC community programme. The target is for the event to raise £3000. The club’s community programme sponsor is Neil Alexander and EMC Services. Town supporters are now busy selling ‘lucky number’ programmes in the run-up to the event. Carmarthen Town AFC has released details of season ticket prices for next season. The award-winning South Wales architects the Lewis Partnership Ltd. have announced the promotion of David Ward to Technical Director. The Llanelli-based firm has a growing portfolio of work projects in Carmarthenshire, Ceredigion and Pembrokeshire. “David’s elevation to technical director from associate director adds further weight to an already experienced team at the Lewis Partnership,” said managing director Philip Lewis. Born and brought up in Ammanford, David is married with two sons, with his family home now being in the Tycroes area. He was educated at Amman Valley Comprehensive School and The University of Glamorgan, Pontypridd. Côr Meibion Llanelli have lined up some very special guests for their annual concert at the Selwyn Samuel Centre, Llanelli, on Saturday, June 30. The guest soloist is tenor Wynne Evans, a familiar face to one and all for his work advertising Go Compare on television. 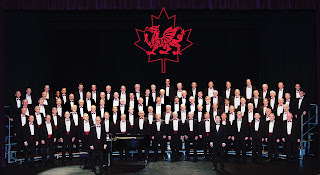 The special transatlantic guests are Vancouver Welsh Men’s Choir, pictured above. “It is a delight to welcome our visitors from Vancouver,” said Côr Meibion Llanelli musical director Eifion Thomas. “There are strong links between Llanelli and Vancouver as we have performed there on tour. “Musical director Jonathan Quick is a great friend and we are looking forward to renewing old friendships. Recycle Week is taking place from June 18-24 and Carmarthenshire County Council is encouraging people to recycle their old batteries. In the UK, less than five per cent of all household batteries are recycled. Many old batteries end up in landfill, where they can leak harmful chemicals into the soil. You can help tackle this problem by recycling your batteries. Many of the items you regularly use at home will be run on batteries that can be recycled including mobile phones, watches, electric toothbrushes, cameras and cordless power tools. Executive Board Member for Street Scene Cllr Colin Evans said: “Each year we throw away about 620 million batteries and if laid end to end they would reach from the UK to Australia and back again. Llannon’s community allotments have been officially opened by the Chair of Carmarthenshire County Council – and there is already a waiting list for the second phase. New council Chair Cllr Siân Thomas cut the ribbon to open the allotments site close to Llannon Primary School. Gardeners have already signed up for all 22 allotments in the current phase of the project run by Dan Snaith, a local resident and Carmarthenshire project officer for Keep Wales Tidy. The committee set up to organise the allotments applied for a lease from Carmarthenshire Council, for 21 years, and were also successful in their application for a £5,000 grant from the Big Lottery Fund. Llannon Community Council also donated £500 toward the project, to cover legal costs. Dan’s father Phil Snaith, who is allotments secretary, said: “From the idea to actual digging on site took 13 months thanks to support and assistance from the council’s Asset Management section in particular. The award-winning South Wales architects the Lewis Partnership Ltd have just been awarded two prestigious ‘benchmark’ international standards awards. To gain the awards, the firm had to undergo a rigorous five-day audit of their practices and procedures. “It was hard work, but well worth it in the end,” said managing director Philip Lewis. The firm has been awarded ISO 14001 and has had its long-established ISO 9001 accreditation renewed. The awards focus on quality management and environmental management. Mr Lewis said: “As a firm of architects we have a reputation in the community and the ISO awards help to show people how seriously we take things like quality management and environmental management. “These are not just ‘tick box’ awards. The demands of each award are very strict and there is a high level of scrutiny on what the company does and how it works. The Jenkins Bakery rolled out the welcome mat for Radio Wales yesterday. Kathryn Chadwick from the Wales At Work show visited the bakery's main HQ in Trostre. 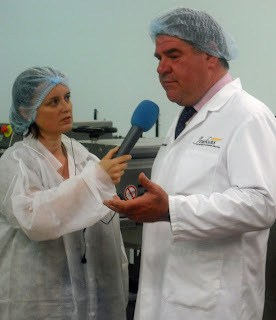 "It was a very enjoyable interview," said the Jenkins Bakery's operations director Russell Jenkins. "We gave Kathryn the full tour and she was very interested in the bakery's proud history as a family firm in Llanelli." Pictured: Kathryn Chadwick interviewing Russell Jenkins. A charity dinner is being held to mark the 25 year anniversary of Ieuan Evans winning his first cap for Wales. Ieuan is the star guest at the event on Friday, July 13, in Parc Y Scarlets. The four guest speakers will be Gareth Jenkins, Phil Davies, Garin Jenkins and Clive Rowlands. David Power, secretary of the Welsh Charitables RFC, said: "The four top speakers won't be the only stars in the room. We have several other ex-Wales and British Lion players who want to come and enjoy an evening of hearing about Ieuan from those who know him so well. Rugby fans can come along and sit among the players they've cheered from the terraces. News from the Jazz In The Bar team at Brecon - The REMI HARRIS TRIO makes a welcome return to JAZZ IN THE BAR on Tuesday, 19 June, from 8pm - £6 on the door, includes raffle ticket strip! - at Theatr Brycheiniog, Brecon. The JAZZ GUITAR WORKHOP is taking place on the same evening, prior to the main performance, with Remi Harris & Ben Salmon. If you haven't booked or made contact, there is still time. It is a wonderful opportunity to learn from and play alongside these outstanding musicians. Fee is £10 and start time is 6.15. We also invite JITB regulars to come along and watch the workshop, if you don't play (no fee). NB IF PARTICIPATING AS A MUSICIAN IN THE WORKSHOP, YOU MUST BOOK AND LET US KNOW IN ADVANCE - thanks.